No. 26 on the C.G.W. Returning from Lehigh Demolishes a House. 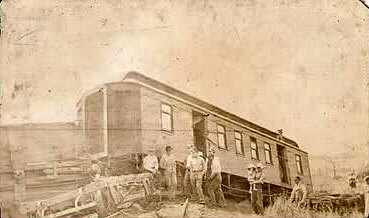 Was a Two Story Structure, 16×24 and Was Being Moved by Wood and Fortney – Engine No. 26 was Slightly Damaged. Engine No. 26, of the Great Western, when returning from Lehigh last night in charge of Engineer Schoonmaker and Fireman Tennant, ran into a house which was on the right of way, and split it into kindling wood, as well as damaging the engine to such an extent that it will be laid up for repairs for some time. The accident is decidedly a peculiar one and perhaps anything similar to it has never happened before, and decidedly not in this part of the country. It happened about two miles from Fort Dodge, between here and Carbon, and a firm named Wood and Fortney were moving a good sized, two story house, the house resting on wagon wheels. They were on the Great Western right of way and not on any public highway when the accident occurred, and had given no notice whatever to the company, that they would be near the track when any train passed. 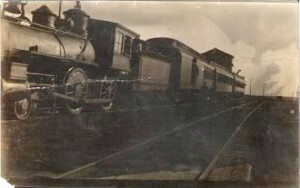 Just as the Lehigh train appeared, coming back to Fort Dodge, the house movers became aware of their predicament, and knowing that it was too late to get the house out of the way, they unhitched the horses and go thtem and themselves out of danger. The train came on and was two (sic) near, when the danger was noticed, for Engineer Schoonmaker to stop the engine. The engine ran full into the house and came out badly crippled on the other side, leaving a shower of kindling wood on both sides of the track. Knowing that nothing could be done Fireman Tennant had jumped and was uninjured but Engineer Schoonmaker, who stayed on the engine was badly was badly skined (sic) and bruised. They managed to get the engine up to the yards here, but it is so badly crippled that it will need a great deal of repairing. The house was said to be a two story structure about 16×24 in size, and there is practically nothing of it left except the kindling wood. An accident that resulted very happily, considering how serious it might have been, happened about 5 o’clock this morning in the Chicago Great Western yards. The track repairers have been at work for some time past in theyeards, repairing the track, and have used mostly sand and cinders as ballast. This usually makes a firm bed for the rails, and the tracks in the yards were considered perfectly safe. Train No. 162, a way freight train due here about 5 a.m., was just pulling into the yards, and was running slowly, when it struck a bad point in the track, and it ran along of its own momentum for about twenty yards. The sand which formed the roadbed was loose and the huge engine sunk nearly to the hubs of the great driver. The left side riding on the ties, was held up, but the right side sunk until it was feared that the whole machine would capsize. As it was, it careened so that but a slight movement was needed to throw it over entirely. Engineer Keltz stuck to his post, expecting every moment to see the engine topple over. His fireman, Tennant, stood in the door on the opposite side, ready to jump, but fortunately neither had ocsacion (sic) to. No one was injured and the wrecking crew soon had the engine back on the rails again.